Walking is a fantastic form of exercise. It’s free, easily accessible, and requires little in the way of equipment. There are no difficult skills to learn and you can walk just about anywhere. Though walking is great, sometimes you just want to make it tougher, more challenging, change it up a bit, and up your calorie burn. We give you the lowdown on what you can do to increase the overall intensity of your walking workouts, so you burn as many calories as possible. If your current walking route takes 25-minutes to complete, try and cover the same distance in 24-minutes. You may feel a little awkward walking more quickly than usual but that is simply because you are doing something new. Maintain your new speed for a week or two and then try and shave another minute off your time. Walk faster and faster as the weeks progress until you are walking so quickly you feel you are almost about to break into a run. This fast speed will increase the cardiovascular demands of your workout and also burn more calories. Just to underscore how effective it is to pick your pace, a 150 lb woman walking for 30 minutes at a leisurely pace of 2.0 mph burns only about 72 calories. But if she increased her walking pace to 3.5 mph (moderately brisk), she’ll burn about 136 calories. At a very brisk of 4.0 mph, it would be almost 180 calories. So there you have it. 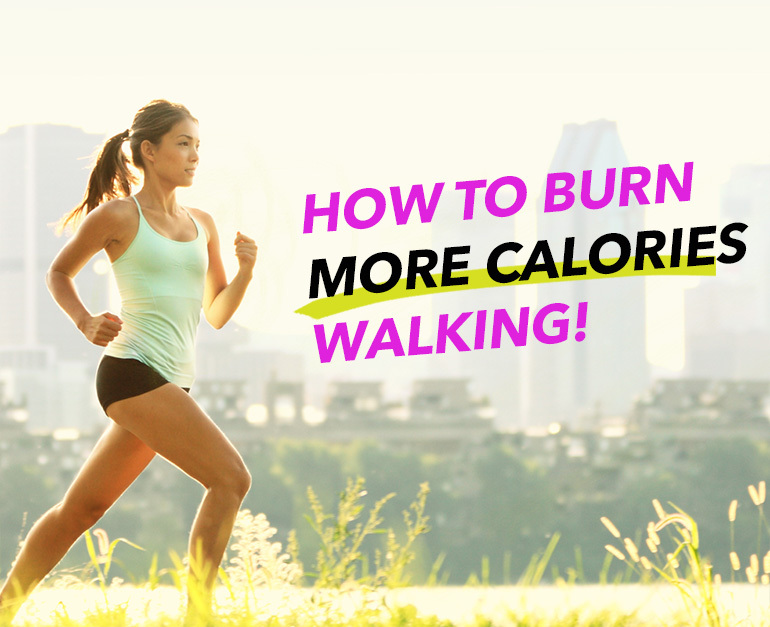 You can more than double your calorie burn, just by walking faster. The longer your workout, the more calories you should burn – assuming you keep your speed constant that is. Try and add a minute or two per week to your walk so you burn more calories. Small, regular increases will gradually add up over the coming weeks and months and result in a big increase in your total energy expenditure. You can easily double you calorie burn by walking longer. Interval training involves alternating periods of hard exercise with periods of rest. For our purposes, this means walking fast for a minute or two and then walking at a more comfortable pace to recover. Continue alternating fast and normal walking speeds over your regular walking course. Intervals increase the average speed of your walking workout and also give your metabolism a bigger boost, which means you’ll burn more calories. Walking up hill is more demanding than walking on the flat and therefore will use more calories. Seek out hills for your walking workout to push your workout intensity up a notch and build muscle. Long, gradual inclines and short, steep hills are both effective ways to increase your calorie burning, so try both and see which you prefer. Walk up fast, walk back down slowly and you have a great hill interval training session. Be sure to take care on the descents, especially on steeper hills, as walking downhill can place a significant stress on your knees. The more you weigh, the more calories you burn. Given that your bodyweight is probably fairly stable, or maybe going down, you can make your walking workouts more demanding by donning a back pack, holding dumbbells in your hands or wearing a weight vest. You not only burn more calories, but are building muscle strength too. As effective as this strategy is, remember to make haste slowly and only add a small amount of weight at a time. Adding weight places additional stress on your muscles and bones. So adding too much weight, too fast could result in sore joints and even injury. Avoid ankle weights as they change your natural gait. The best way to add weight to your workout is a weighted vest, as it evenly distributes the added weight. However, if you have hip, knee or ankle problems get the okay from doctor first. If you have peaked in terms of walking speed and feel like you are about to break into a jog, why not go for it?! While jogging does place more stress on your joints than walking, it is a natural extension of walking and burns way more calories. Using the interval method, you could walk for three to five-minutes and then jog for one to two-minutes. Alternate between walking and jogging. Then gradually increase the length of time you spend jogging and reduce the length of your recovery walks. A 150lb woman walking for 30 minutes at a very brisk 4.0 mph will burn nearly 180 calories, but if she breaks into a light jog (5.0 mph pace), she’ll burn a massive 286 calories. That’s a calorie boost of 60%! Remember that jogging and running are more stressful on your joints, which means it’s not for everyone. If jogging and running aren’t for you then don’t worry – you are in good company. Use one of the other calorie burning strategies to increase the fat burning potential of your walking workout. Or, if you’re set on picking up speed, try using the elliptical machine, which mimics running (including the high calorie burn! ), but without the impact on the joints. Walking on grass, trails, sand, or anywhere “off road” makes walking more challenging, works your muscles harder and burns more calories. Uneven surfaces mean your muscles have to work harder to keep you stable and the shifting ground means your gait will be less economical. In exercise, less economy is good as it means you use more energy and burn more calories. Walking in sand for example requires 2.1 to 2.7 times more energy than walking on a hard even surface. If you are going to venture off road, make sure your walking shoes are up to the job; it may be worth buying some walking boots to protect your feet and provide some ankle support. If you do choose to venture far from home and into the wilds of nature, make sure you tell someone where you are going, what time you’ll be back and dress for whatever weather you are likely to face. Adventurous, off road walking is a more serious undertaking than walking around your neighborhood during your lunch break, and so requires a little more planning ahead, but is well worth the bit of extra hassle. Do like the Scandinavians and add Nordic poles to your walk, which will bring a lot more muscles into play and increase your calorie burn. Nordic walking engages the chest, arms, shoulder, ab, and other core muscles that would otherwise be minimally targeted by walking. And it boosts calorie burn by up to 46%! If you want to lose weight, walking can help get you there. Aim to clock up around 150-minutes of walking a week – that’s a little over 20-minutes a day – and you will burn at least 1000 calories a week. This figure will be considerably higher if you incorporate some of the above calorie boosting strategies.